Orthodontic devices help align the jaw, palate and teeth to improve your smile’s aesthetic appearance, improve and correct bites and can aid in improving oral hygiene. Many people can benefit from the use of orthodontics. These types of treatments are often associated with children and teens, but adults who have crooked teeth, an underbite or overbite, or any other tooth, jaw or palate abnormality can also benefit from orthodontics. What is involved in orthodontics procedures? Orthodontic treatment for adults generally involved the application of braces to both the upper and lower teeth. However, in some cases Invisalign can be employed to correct a range of issues. As a clear, removable appliance, Invisalign is often a discrete treatment option for many patients. Improved facial, teeth and jaw aesthetics. Superior functionality, movement and comfort as a result of a better bite. The better positioning of the teeth as a result of orthodontic treatment can enhance the effectiveness of further treatment options such as veneers, bridges, crowns, implants, etc. Predominantly adult orthodontic treatment takes longer to complete than children as the jaws and teeth are less malleable. However, the majority of treatments are still able to be complete in 24 months or less. 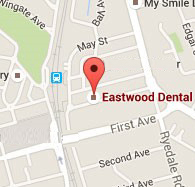 At Eastwood Dental we also recognise the importance of aesthetics and we will always endeavour to provide you with all the alternatives treatment options (if available).